Summary: Building systems to detect tumor, in this case prostate cancer, is often hard due to a lack of data. 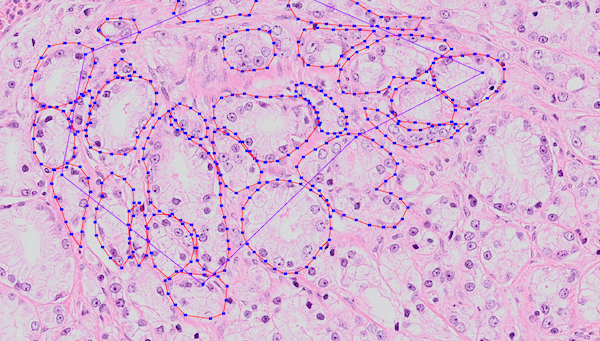 Tumor annotations made by pathologists are often coarse due to time constraints. With this project we want to automatically refine these annotations by building a system that can automatically filter out irrelevant parts of the data. Recently, I presented a conference article at SPIE Medical Imaging 2018, as part of my PhD in computational pathology, deep learning and prostate cancer. In this project we tackled the problem of epithelium segmentation using deep learning. It was the first project I worked on within computational pathology. This post gives a highlight of our work. Want to have more in depth details? All details on the data, training procedure and network architectures are available in the article itself. Prostate cancer (PCa) is the most common cancer in men in developed countries1. PCa develops from genetically damaged glandular epithelium and in the case of high-grade tumors, the glandular structure is eventually lost2. As PCa originates from epithelial cells, glandular structures within prostate specimens are regions of interest for finding malignant tissue. Building systems to detect tumor is often hard due to a lack of data. In general, more data equals a higher performance. 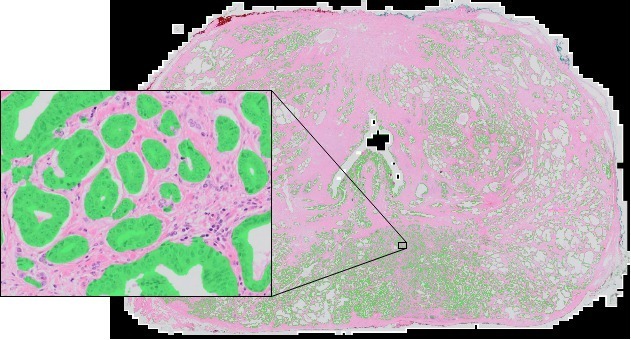 Typically, deep learning methods that try to detect cancer from scanned tissue specimens use a set of annotated cancer regions as the reference standard for training. As these algorithms learn from their training data, the quality of the annotations directly influences the quality of the output. Tumor annotations made by pathologists are often coarse due to time constraints (see picture below, 2nd image). Outlining all individual tumor cells within PCa is practically infeasible due to the mixture of glandular, stromal and inflammatory components. These coarse annotations limit the potential of these deep learning methods. We propose a method to automatically refine these coarse tumor annotations by training a system that can automatically filter out irrelevant parts of the data, in this case all non-epithelial tissue. This method results in fine-grained annotations without additional manual effort. As data for our experiments we used 30 digitally scanned H&E whole mount tissue sections from 27 patients that underwent RP treatment. The reported Gleason growth patterns in these sections ranged from 3 to 5. The specimens were randomly split into three sets: 15 slides for training, 5 for validation and 10 for testing. We compared U-Net3 (which is specifically designed for segmentation) and a general fully convolutional network (FCN). For both types of network we tested differences in layer depth. The networks are trained on patches extracted from digitally scanned prostate tissue slices at 10x magnification. The most important numerical results can be found in the table below. See the article for a breakdown in cancer/non-cancer. For both types of networks, the deeper the network the higher the performance. However, a deeper network also increases the parameter complexity, especially in the case of the FCN. Given the comparable performance, we labeled the U-Net as the winner given its lower parameter count. The best U-Net produces fine grained segmentations and achieves a F1 score of 0.82 and an AUC of 0.97. Room for improvement lays with segmenting glands as a whole. Our models rarely misses complete cancer regions, though with some high-grade PCa only parts of the glands are detected. We suspect that most of the errors are, first of all, caused by a lack of training examples and not due to a limitation of the models. A logical next step is to improve our dataset. However, manual annotations are flawed due to the difficulty of making correct and precise annotations, especially in tumor areas. A potential solution for this is using immunohistochemistry to assist in making annotations. By using specific stains that highlight epithelial cells, we hope to generate precise and less erroneous annotations of epithelial tissue. This work was presented at SPIE Medical Imaging 2018. Want to read more? Please refer to the conference paper as it contains more detail on the data, training procedure and network architectures. Feel free to add any questions as comments to this post.